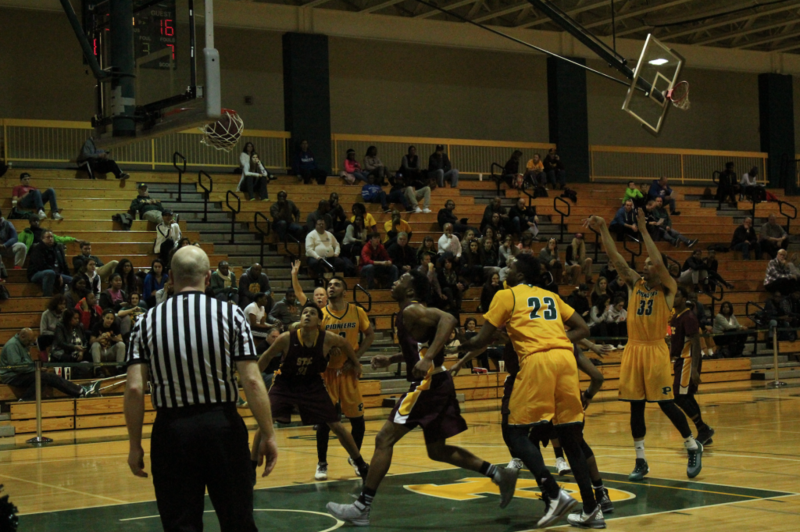 In what was nearly a comeback for the ages, the men’s basketball team (16-10) survived for an 80-73 victory against East Coast Conference arch-nemesis, New York Institute of Technology (3-21), on Thursday, Feb. 16, in the Battle of the Boulevard at the Pratt Recreation Center. The Pioneers went 2-0 on the week, beating neighboring NYIT and Daemon College. The Pioneers erupted in the first half as they kicked off the contest with a 14-2 run in the first four minutes of action. Senior guard Akosa Maduegbunam had the hot hand early; nailing back-to-back three pointers and sophomore forward Hunter Powell tallied five points for the hosts. A remarkable opening stanza for the Pioneers ended in a 15-2 burst anchored by Maduegbunam, who scored seven points to bring his total up to 13. Junior forward Greg Dotson also provided nine points and seven rebounds for the Green and Gold in the first twenty minutes. The Pioneers brought a 47-24 cushion into the locker room after senior guard Devon McMillan scooped in a buzzer-beating lay-up. However, the second half was a completely different story as the Bears offense began to come to life after being ice cold in the first half. The Bears tore up the Pioneers defense behind the lights of senior guard Khalif Chaplin who poured in 26 points on the evening, with 19 coming in the latter stanza. NYIT eventually narrowed the deficit to five points (72-67) with 2:11 left in regulation. Junior guard Jared Hall had other plans though; he knocked down four clutch free-throws in that final stretch, securing the win for the Pioneers. Also, Dotson and Maduegbunam each knocked down a pair of foul shots during that juncture. Hall finished with 20 points off the bench for the Pioneers followed by Maduegbunam who posted 17 points and seven rebounds. Although Dotson had a quiet second half, he still earned a double-double with 13 points and 11 boards. Coach Smiles and his Pioneers squad squeezed out another nail-biter on Friday, Feb. 19, when they ousted Daemen College, 88-76, in another ECC matchup at Lumsden Gymnasium in Amherst, N.Y. In a game that was headlined with runs, the Pioneers went on an 11-1 uproar in just under two minutes to jump in front of the Wildcats, 41-40. Dotson put the visitors ahead with 17 ticks remaining in the opening period, scoring the last five points of the burst. Although they trailed 42-41 at the intermission, the Pioneers offense clicked on all cylinders, as they shot the ball just under 42 percent from the eld and 70 percent from downtown. Hall scored eight points during a 14-2 streak to open up the second half, putting the Pioneers in front for good. The Green and Gold refused to look back and eventually extended their lead to double-digits, going up 86-74, with just over a minute left on the game clock. For the second straight outing, Hall was the game’s leading scorer with 20 points. He also had seven rebounds and five assists. Senior guard Dillon Burns racked up 10 points in addition to his seven helpers and five boards. In 21 minutes off the bench, McMillan logged 12 points while Maduegbunam chipped in again with eight points and five boards. The Pioneers currently sit at 11-7 and fourth place in conference play as they look to lock up a spot in the ECC Tournament when they play host to the University of the District of Colombia on Saturday, Feb. 27, on Senior Day. Tip-off is scheduled for 3:30 p.m.